Torger Børresen, DTU Aqua, is the contact person in Denmark. He is the overall coordinator if the whole SEAFOODplus project, and the Research Director of the Department of Seafood Research at DTU Aqua, National Institute of Aquatic Resources. He has a long-standing experience as manager of research at all levels, counting project leadership, management of project groups and a research centre, department management and top administrative management at research institute level. He has extended teaching skills at all levels, and has been responsible supervisor for a substantial number of Ph.D. students. Due to his academic skills he has been serving at research councils, advisory groups for research within the food and technology area nationally and internationally, and is still active in the academic world, serving e.g. on editorial boards for scientific journals. He has a long experience in collaborating with industry and industry associations, and has an extended network within both academia and among decision makers nationally and internationally. A ‘SeafoodCircle’ has been created in Denmark. 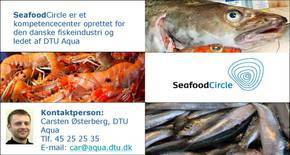 It is a forum for disseminating SEAFOODplus results to the Danish Fish Industry and other stakeholders in Denmark. It is hosted by DTU Aqua. A homepage has been established at www.seafoodcircle.dk and newsletters and fact sheets are sent out regularly highlighting project results. Further, meetings are arranged within thematic areas and brainstorming sessions are held to stimulate innovation in the industry, particularly among SMEs. Annually an award is presented to the company having documented the best collaboration between research and industry. Dansk Fisk er en del af FødevareIndustrien i Dansk Industri og repræsenterer i dag over 60 virksomheder inden for handel og produktion og med en samlet omsætning på ca. 9 mia. kr. The Association of Danish Fish Processing Industries and Exporters is an association of approximately 100 companies processing and exporting fish and shellfish to 75-100 countries all over the world – every day of the year. Foreningen er hovedorganisation for Danmarks 76 lokale fiskeriforeninger, der igen som medlemmer har både ejere af fiskefartøjer og ansatte fiskere. Medlemstallet holder sig - efter en turbulent periode de seneste 10 år - nu nogenlunde konstant omkring de 3.500. Organisationen har omkring 300 medlemmer. Den tæller såvel landet omkring 170 dambrugere som havbrugere, åleopdrættere, fiskeeksportører, foderfabrikker og forædlingsvirksomheder inden for akvakultur.Den nye organisation omfatter en samlet produktion på ca. 40.000 tons årligt og en eksportværdi på en lille milliard kroner. Omkring 95 pct. af produktionen går til eksport. The homepage contains valuable information about common fish species traded by the members of the association, and gives recipes and other, more general information. It also gives directions to where all retail shops of the member are situated.